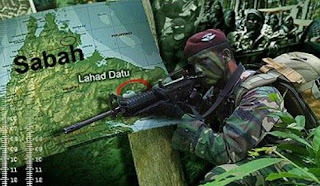 By Ida Lim - KUALA LUMPUR, March 7 — Putrajaya’s full show of military might on Tuesday against the Sulu militants in Sabah could be politically calculated to impress Malaysian voters ahead of Election 2013, a Manila-based paper has said. In an editorial titled “Consequences”, the Philippine Daily Inquireryesterday noted that both the ruling Barisan Nasional (BN) coalition and the federal opposition had attempted to outshine each other in pushing for tough action on the estimated 200-odd armed Filipinos that had intruded into Sabah’s east coast more than three weeks ago. “The massive air-ground offensive itself was probably a consequence of political calculations regarding the coming election in Malaysia; both the government and the opposition (led by Anwar Ibrahim, so-called friend of Filipinos and self-proclaimed admirer of Jose Rizal) have tried to outdo each other in striking nationalist postures and calling for the most aggressive action possible. “The result: military aircraft dropping bombs on a band of men (and women) armed only with handguns and rifles,” the paper wrote on its news portal. It suggested that the Malaysian government’s decision to launch the attack was due to the close contest between BN and the opposition in the 13th general election that must be called by April 28 and held no later than June this year. In Tuesday’s attack by the Malaysian military, the defence minister had on the same day said that three F-18 and five Hawk aircraft were used, while five battalions of soldiers have been sent in to join hands with the police force. The armed militants, known to be followers of the self-proclaimed sultan of Sulu Jamalul Kiram III and led by his brother, had occupied Kampung Tanduo for close to a month, insisting that Sabah belongs to the Sultanate of Sulu. The group led by Jamalul’s brother Agbimuddin Kiram had previously clashed with Malaysian security forces in areas around Lahad Datu, Semporna and Kunak, three towns on Sabah’s east coast, encounters that have left eight Malaysian policemen and some 20 Sulu gunmen dead. Self-styled Sulu “princess” Jacel Kiram yesterday morning reportedly said that the militants had survived the Tuesday attack and search operations. The daughter of Jamalul, one of nine claimants to the Sulu Sultanate, also said that Agbimuddin was willing to release the four Malaysian hostages that they claim to be holding captive. Inspector-General of Police Tan Sri Ismail Omar yesterday said the security forces were carefully searching an area of four square kilometres for the Sulu gunmen. He told the media yesterday that more Sulu militants had died in a gunfire exchange with Malaysian security forces, but did not specify the figure. Another Sulu militant was reportedly shot dead yesterday morning. The Sulu militants claim that Sabah belongs to them, saying that the land was granted to the Kiram family by the Sultan of Brunei in the 17th century. But Sabah joined Sarawak, Singapore and Malaya to form Malaysia in 1963. Malaysia reportedly pays an annual stipend of RM5,300 to the Sultanate of Sulu on the basis of the sultanate ceding its rights to the Borneo state.